Todays video is on saffron. Saffron is expensive! a quick look on Amazon shows the lowest price around $5.25 a gram, which is approaching $2400.00 a pound. Um, yeah, right? Fortunately it packs quite a punch flavor wise and not only does a thread of saffron contain a lot of flavor, but it is essential that you don't use too much of it or it's rather odd and dusty flavor can unbalance a dish. So we can be thankful for that serendipity. Anyway, $2400.00 a pound and up, what's up with that? I'll tell you what's up with that from personal experience. Saffron is expensive for two reasons. Not a lot is produced per acre and more importantly, there are no saffron processing machines. Each flower produces only three threads of saffron, which are the red female flower parts that receive pollen (or at least they used to, now the plant is sterile). Every flower has to be plucked out of the ground, which is slower than you might think because they are buried in a brush of tough leaves, Then someone has to pick that flower up and nimbly extract the three delicate red threads without pulling out too much of it's lower white part which has no flavor, and without any other unwanted stuff like bits of petal or the male pollen bearing parts. If the worker is to neither starve nor be fired post haste, this must be done rapidly and preferably by plucking all three threads at once, not breaking them off short or pulling off one or two at a time. Every year thousands of mostly young and lazy people flood the region I call home to engage in the harvest of cannabis. One of the more time consuming jobs employing thousands is trimming the buds to remove the larger leafy parts. Of course there are no statistics for a black market industry, but thousands flock here for this relatively high paying job. It is tedious work, just like saffron plucking, but the pay is vastly better. If saffron were illegal, people would flock to saffron growing regions to pluck saffron and leave with enough to live on for 6 months or more. Alas, saffron production is an entirely legitimate business and if you go to follow the saffron harvest, I think you'd better save up for a while first and bring extra money with you for your saffron processing vacation! I had some illusions of possibly growing the stuff for side income. Well, let me tell you, those notions came to a screeching halt when I weighed an hours yield of saffron plucking not even including growing and harvest. I'm going to try again someday when I'm better at it, but at this point is looks like it's the kind of work that the first world always shuffles off onto some place where people have fewer choices for employment. I can tell you, if you pay 2400.00 a pound for saffron, someone is getting royally screwed in that transaction and it ain't you! You're certainly getting a bargain. But hey, money isn't everything and I'm about the biggest fan around of divorcing ourselves from the everything-has-a-price-tag, time-is-money, market value mindset. I've spent a lifetime unlearning that way of thinking in order to pursue the kind of knowledge that I'm after. If I stopped to value the stuff I do all the time, I would do very little of it. That means I am poorly adapted to the modern paradigm and really have low survivability in the current default society, but that's okay with me. There are things more important than money or survival. Look buddy, when the local economy collapses because of the legalization of marijuana I'll at least have saffron aplenty for my mixed rodents with gourmet mushrooms and acorn sauce as I slowly starve to death up here in the hills defending the last of my carrot crop from wandering bands of starving out of work pot growers. Nope, the saffron industry will never replace the pot industry in the emerald triangle but, thanks to it's inherent potency, growing enough saffron for your own yearly supply is very easy and not even that time consuming! I enjoy plucking those precious little red threads out, at least to a point, and processing the flowers from a bed 4x6 even at the peak of the season is basically the amount of time it takes to watch a tv show or part of a movie. I would present for your consideration the idea that kind of busy work is good for the soul. Saffron is easy to grow here. I just plant the bulbs and maybe weed them and that's it. I did get two different batches of bulbs and so far one batch is far out performing the other, so that is something to think about. There are different strains, no doubt due to epigenetics or to random mutations over time since the plants do not produce seed but are grown solely by dividing the underground parts and planting them. While the bulbs are rather pricey, it might be worthwhile to pay extra for a proven producing strain if you can find a seller you have that kind of confidence in, like a producer that sells bulbs on the side to subsidize saffron thread production. The worst problem I've had is that rodents seem to love them. I had to plant them in a wire lined bed to keep gophers out, which has worked well for a few years now. I've also made a lot of naturalized plantings, but they have done poorly so far. I had hoped I could just scatter the bulbs all over the hills and wander around plucking them with the theme song to The Sound of Music playing through my head, but it is looking like they are not well enough adapted to this climate or soil. I haven't given up yet, but it's not looking good. I'm not sure where all you can get away with growing the stuff, but you can look into that on your own. It seems to grow well in my mild Mediterranean climate. The flowers bloom in the fall and are harvested daily or up to every other day as they emerge and processed immediately. Dry the threads quickly, but out of the sun and store in a dark jar. It is an oddly flavored but delicious spice and I'm finding more and more uses for it. Yesterday morning I made browned chanterelle mushrooms in a butter and caramelized maple syrup sauce with saffron, vanilla and candy cap mushrooms. Was it good? Do you have to ask? Omg, it was so good. Well, that's it. Watch my short and very pretty video, because it's cool and I worked hard on it. And share it with someone you love so I can get more views and buy axes! I don't actually really want any more axes, (though I probably want different axes). I just want to test them all. I'm only interested in having a pile of axes to the extent that it serves the purpose of learning me all about them. Once I determine an axe or other tool is dead weight, just like an apple variety or saffron strain that doesn't perform, It's getting the axe so to speak. Skills and knowledge over gear. I have too many possessions already due to my not-so-simple living. I also don't need more saffron than I can process, or tons of saffron that I have to care for, but can only process for 3.00 an hour. Okay, maybe with the right marketing, selling local organic saffron to fancy by area restaurants maybe I could hit the point where saffron production is at least equivalent to very low paying job like working at walmart. Or, maybe I'm wrong and I'll get super fast and crack the saffron code to make it a potentially viable business. I think saffron will remain a labor of love though. Anyway, I was saying that I don't need tons of saffron plants, so I can sell the extra corms to other would be saffron growers, which is honestly probably much more lucrative than saffron production. Once I dispose of the poor producing strain and expand the good producing strain, I'll probably have bulbs for sale in my little SkillCult e-store or on ebay. Until then, I think you'll see saffron cropping up in a recipe here and there. Note that there is no advertising on this site, nor am I constantly pushing you to buy products, but only occasionally link products that I can pretty much get behind with little or no qualification. That is no accident. I feel that having advertising everywhere is contrary to my goal of convincing people to learn and do more for themselves and consume less. The medium is the message as they say. However, when you do need to buy stuff, you can help me succeed at my endeavors by bookmarking this link ( http://amzn.to/1Ne861e )in your browser bar and using it whenever you shop on Amazon.com. It costs you nothing, but it has the potential to help me a lot if enough people do it. If you don't know how it works yet, that link contains an ID that credits me a small commission around 4% to 6% on anything you buy through it. That's why most sites are covered in links and ads pushing you toward Amazon or other affiliate programs. I really don't want to do that, and I don't think you want me to either. And a huge thanks to those of you who already use that link, it does make a difference! 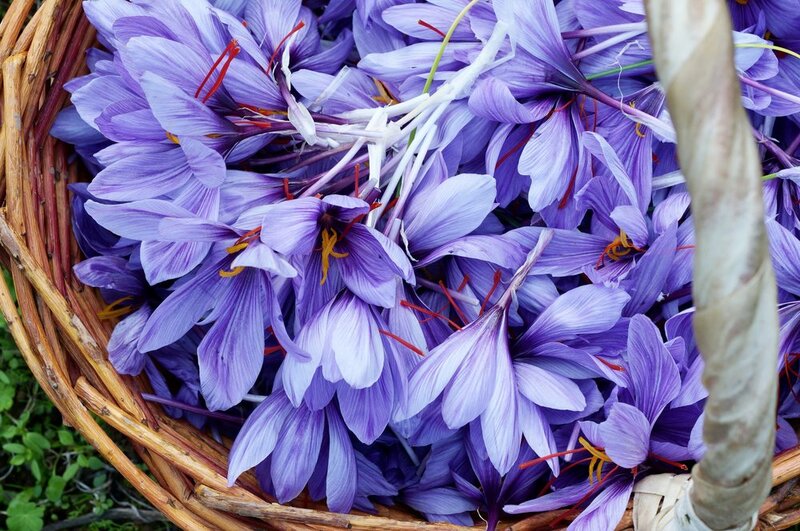 Posted on November 20, 2016 by Steven Edholm and filed under food, Food and Drink Making, Homesteading, flowers and tagged saffron flowers food homestead gourmet crocus fall crocu crocus sativus spices the most expensive spice growing saffron how to grow saffron harvesting saffron how to harvest saffron how to dry saffron saffron bulbs.